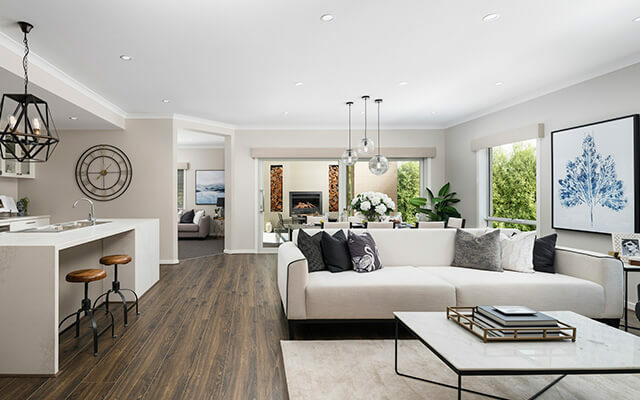 Dennis Family Homes has recently opened two stunning new displays in Melbourne’s south-east that are sure to appeal to families hunting for their perfect home design. 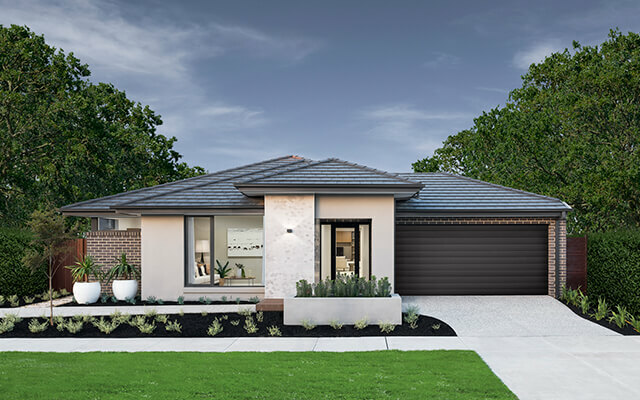 Visitors to the Dennis Family Homes display centre at Marriott Waters estate in Lyndhurst are invited to inspect the 2-storey Marsden 363 Resort and the sprawling, single-level Macedon 333 Verve. Both homes are part of Dennis Family Homes’ Inspirations Series and offer four bedrooms, three living spaces, two bathrooms, a study and a double garage. The larger Marsden also has a convenient guest powder room downstairs. The presentation of two very different homes, side-by-side, gives visitors the opportunity to assess each design on its merits and select a floorplan that will work best for their family and the block they are planning to build on. When building with Dennis Family Homes, customers can choose from a huge range of design options available and feel confident that they will ultimately have a beautiful new home that reflects their personal style. 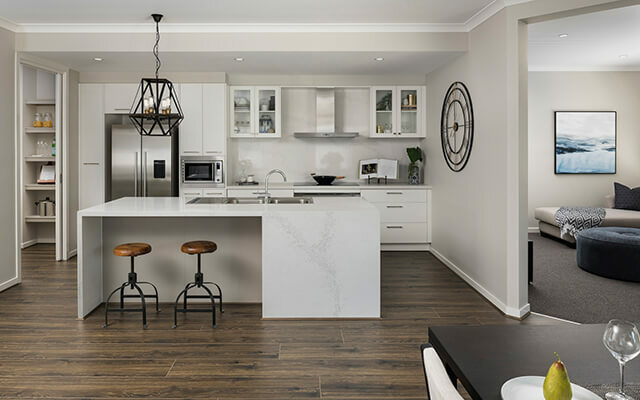 The Marsden and Macedon displays showcase Dennis Family Homes’ Premium range of inclusions that is available with Inspirations Series homes and also feature a number of quality upgrades that demonstrate clever ways to customise a design. Customers who select the Premium range have a choice of eight different kitchen island ad ensuite vanity designs, alternative kitchen overhead cupboard configurations, and five different vanity basin and tapware choices, all at no extra cost. Also available are high-end finishes like 20mm or 40mm reconstituted stone benchtops in the kitchen, butler’s pantry and bathrooms, soft-close drawers to the kitchen cabinets and a tiled shower base with channel grate in the master ensuite. Both displays at Lyndhurst feature contracting interior colour schemes that demonstrate how the combination of finishes and styling can create a truly individual feel to a home. The two-storey Marsden design presents a contemporary interior where a muted grey and white palette is complemented by dark timber tones and selected black accents throughout the home. In contrast, the expansive Macedon offers interiors that reflect simple Scandinavian design. Clean crisp whites are paired with honey timber tones and organic accents like concrete, felt and textural linens. Suitable for construction on blocks from 12.5 metres wide, the Marsden is available in any one of four facades. 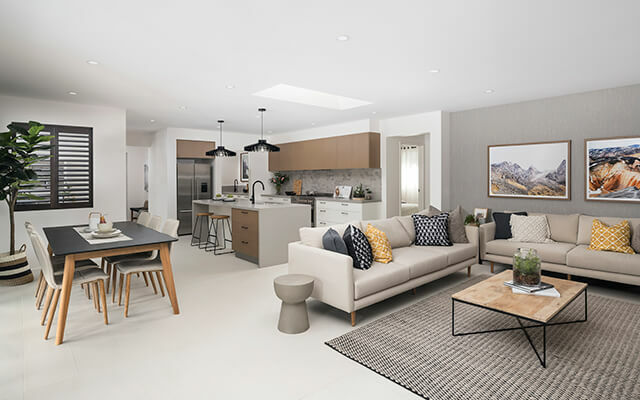 Customers can choose from three floorplans, the 343 square metre home on display and two versions of the smaller Marsden 323, one with a study and pantry to the rear and the other with a pantry to the side of the home. Offered in three sizes, the Macedon 333 on display is 304 square metres and is also available in a smaller 287 square metre version or the significantly larger 327 square metre design that has five bedrooms. The Macedon has been designed for construction on blocks from 16 metres wide and comes in eight facades to suit a variety of tastes. Open daily from 11am to 5pm, the Dennis Family Homes display centre is located in Seachange Parade, Marriott Waters estate in Lyndhurst.